If a recipe calls for one cup of sugar, and you only use 1/4 of a cup, and you let that be known, you'll get some strange looks, believe me. What's funny is usually those strange looks come from the people who ask you not to keep "bad for you" baked goods around the house. When I grab a peach usually, I don't dip it in sugar before I bite into it. I like it the way it is. Natural and sweet. Anyways. This is sort of a "good-for-you" treat. I won't mention the fact that it's delicious with a little (or a lot) of ice cream on top. It's also good right out of the pan, without adding anything to it. Using only a little amount of sugar keeps it sweet and a little bit tart. You'll enjoy it and won't feel like a pig after eating it. Unless of course, you eat the entire crumble in one sitting, in which case, I'm totally impressed. Place a rack in the center of the oven and preheat to 350 degrees F. Place sliced peaches and raspberries in a square 8×8-inch baking dish and set aside. In a medium bowl, whisk together flour, sugar, oats, spices, and salt. Add the butter and toss the mixture together with your hands. Break the butter up into the flour mixture until the butter is the size of small pebbles and oat flakes. This took me about 4 minutes. 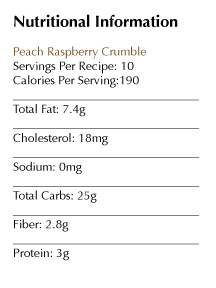 Toss a generous handful (about 1 cup) of crumble topping into the peach and raspberry mixture. Toss loosely with your hands. Spread fruit evenly in the pan and top with the remaining crumble mixture. Bake until fruit is juicy and bubbling, and the top of the crumble is slightly browned and crisp, about 30 minutes. Remove from the oven, let cool slightly, and serve with vanilla ice cream. Crumble is delicious served warm and can be stored, covered, in the fridge and reheated in the oven or microwave for serving. Thanks for visiting my blog. I must try this out. I made a mango raspberry crumble without any sugar. The mangoes were sweet but the raspberries not so, sugar may have helped. Everyone still liked the mini crumbles.